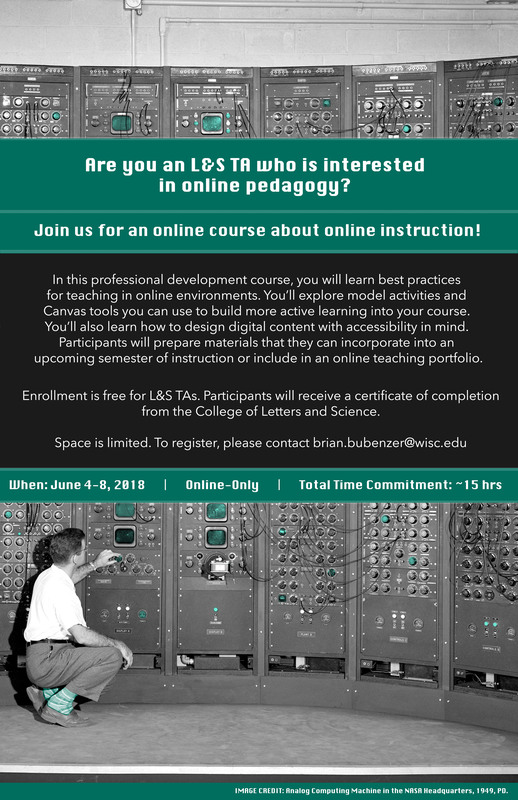 In June 2018, I had the opportunity to be the primary facilitator for an online course about online instruction. The course had been offered for the first time during the past summer. As part of a team at Learning Support Services, I examined course learning objectives and participant feedback from the course’s pilot run and helped to revise course readings and activities for the class. Some of our goals were to develop more resources about universal design in online courses and to increase the number of examples and modes of online communication that participants were able to explore. As the facilitator for the one-week course, I was the primary point-person for a group of 25 TAs. I held two synchronous group conversations via BlackBoard Ultraconference as well as daily office hours. I also moderated discussion boards and provided feedback to participant questions in online reflection journals and assignments.